Place chicken in pressure cooker. Mix together, lemon juice and zest, orange juice, olive oil, garlic, paprika, dried oregano and red pepper flakes. 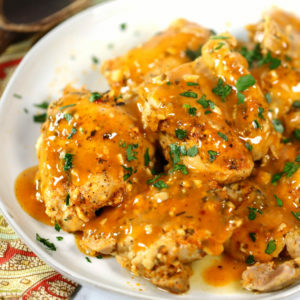 Place chicken on serving platter and drizzle with reduced sauce; Garnish with chopped parsley. Use chicken breast or a variety of chicken pieces, whatever works for you! If you like it extra spicy kick up the red pepper flakes. Serve it up with a side of rice, with a cool salad to cut the heat, or even shredded in a tortilla!